Earlier this fall, a dear friend of mine became a homeowner. Her new bit o’earth is a lovely place – it boasts an old flower garden, a bountiful floor of lemon balm, and three big old pear trees! As she was in the middle of renovations and moving in, most of the pears were going to waste and to wasps as they fell on the ground. I begged the assistance of the 11-year old who was hanging out with me, and together we gleaned three or four plastic bags full of ripe pears! Because I am a boozy pixie, the very first thing that I made with those pears was a lovely cordial. My resident taste-tester promises that this is the best cordial that I’ve made yet! Well. Isn’t that sweet? First, chop the pears. I left the skin on mine, as it gives a nice little bit of bitterness and lends itself to a fuller flavored cordial. Set aside the cores and discarded parts to make vinegar (post coming soon!). Add a handful of chopped pears to a large mason jar. Cover that with a teaspoon of sugar. Add more pears, and sugar. Repeat these layers until the jar is full. Or two jars. However much you want to make is entirely up to you! Put a lid on the jars and let them sit for a while, about 30 minutes to an hour. The sugar pulls the juice out of the fruit, and the overall effect on the richness of the cordial’s flavor is worth the extra wait. Fill the jars with your booze of choice. I prefer using a decent quality vodka so that the main flavor is that of the fruit, not the alcohol. Label your jars with the contents and date. Don’t be like me and write “Plum Cordial” or you’ll be confused, bemused, and amused when you retrieve them from the cabinet in a month or so. I started the cordials on August 14 and strained them in the second week of October. Shake the jar up before you strain the cordial to make sure all of the sugar has dissolved completely. Use muslin, cheesecloth, or a mesh strainer to keep out the pear chunks. Put your tasty cordial in clean, sanitized bottles. Label them well, and give them as gifts (or hoard them like you know you want to, you booze dragon, you!). A lovely bottle of this cordial was given as a housewarming gift to my dear friend who told me that I can return every year to glean as many pears as I wish! Ooh this looks lovely. I’ve been trying for the last few years to make pear wine and have been rather unsuccessful with the flavor. I think I will be trying this from now on! 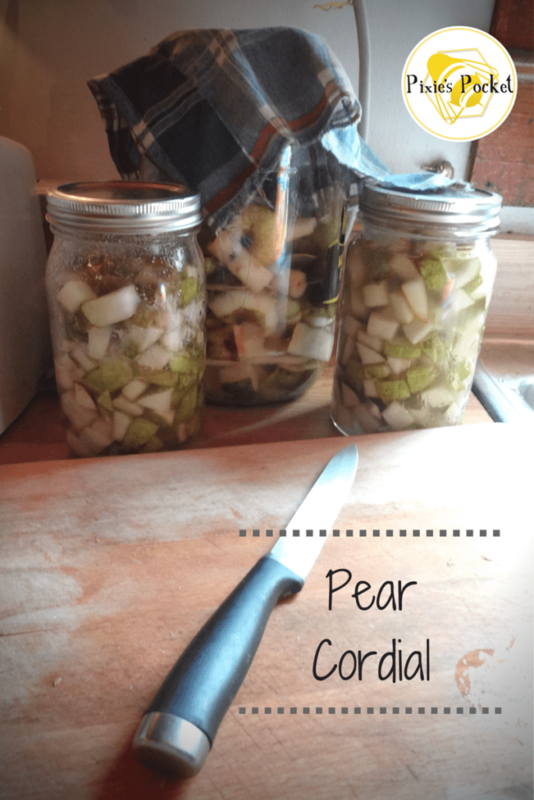 I have had a good lime cordial using this method but never thought to use pears or apples! Pear is so picky. Have you tried making the wine, and then racking the finished wine over onto some freshly chopped or grated pears to re-infuse it with fruit flavor? It’s a technique I’ve done with strawberries, and it really made the flavor come through! I hadn’t tried racking onto fresh fruit but I will give it ago next time!